Dame Named Redd Designs: 387 - Holy Crap! As you may or may not know, I have a black thumb. Some lucky people can keep plants alive whereas I can't seem to keep them around for very long. This year I planted a garden at our new house. And against all odds, things grew! 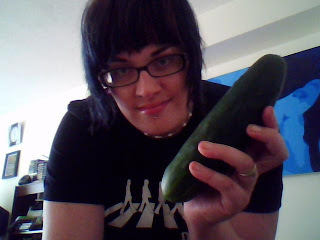 Today I picked our very first vegetable (other than lettuce). Ash says it tastes buttery and juicy. I'm not sure if that's a good thing or not, but he's still eating it. Take that Mother Nature! I finally grew something!! Wow. Good job! I can't keep anything alive either! Our garden is the size of 12 houses, but all because of Jay! Power to black thumbs! !